1. Great Lash Mascara- I always keep clear mascara with me because sometime my eyelash hair irritates my eyes. And its perfect when I don't want to add more black mascara. 2. Warm Vanilla Sugar Lotion- I always have to keep lotion with me because I constantly wash my hands. And my favorite scent to use from Bath and Body works is this one. 3. Shea Moisture Fruit Fusion Coconut Water Shea Butter Lip Balm- I recently picked this one up from Target and so far I am loving it better the my other chap-sticks. The lip balm is clear and has the right amount of shine for your lips as well as moisturizing. 4. Max Factor X Masterpiecemax Black Mascara- When I want my eyelashes to stick out more I usually just apply one coat and I am good to head out the door. 5. LA Color Lip Gloss (Fuchsia)- I love to add a pop of color that is subtle and matches my skin tone. I love how it stays on all night and isn't to bold for my lips. 6. Max Factor X High Precision Liquid Eyeliner (Black)- I usually just have this in my bag in case I want to go extra with my eyes. I don't really use it that often, I try to keep my makeup as natural as possible without too much. 7. Quilted Cross-body Bag - When I go out I usually fit all my stuff including my wallet( not pictured) in this bag. The only difference is my bag is the cream color of this one. I got it one year as a Christmas present and it has been my go to bag ever since. 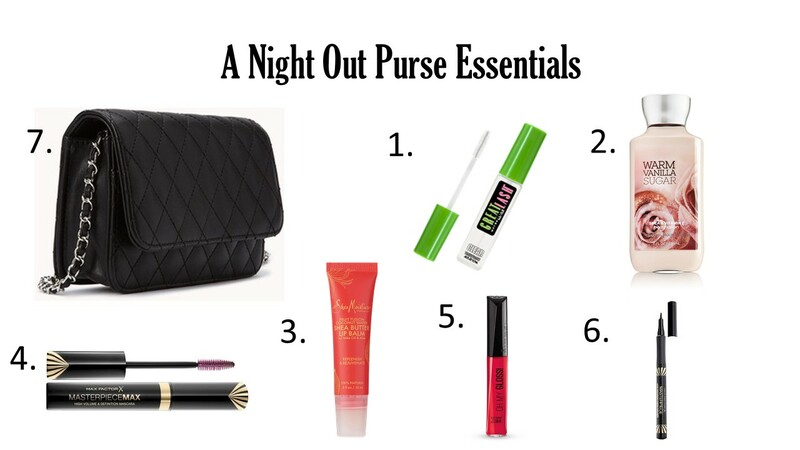 I hope you enjoy my night out purse essentials and comment below what you keep in your bags. Have a nice day.